For how long have you been making lamps and how did you first get into it? Txuma: I started working on lamps with Guy (Radiance) some 10 years back. During this period I developed the popular thread globes, by then Guy had had enough of his business and wasn’t ready to expand. So I left Radiance and decided to open my own business with Elodie so we could do our own designs. That was in 2008 during the global economy crisis and everybody told me not to do it, that this would be the worse time to start something new. But since then our business has grown and we haven’t stopped make new designs. Elodie: We have no background in making lamps however here we are. We are learning by experience. Can you take me through your design process? Elodie: This really depends. Txuma: We have so many designs it is difficult to say. For example the thread globe, I simply took my sons basketball and I threaded it. And if I think about it, it is really the matter that inspires me. The matter tells you what to do with it. Elodie: Sometimes you also have something on your mind, you craft it and it doesn’t really work out but you look at what you have in your hands, and somehow another design comes out. Sometimes through a mistake a new design might come out. For example once we had a piece fall down on the ground and it gave us a new idea. To make lamps using raw materials such as sand or even mud. So it is really by chance. Elodie: And of course we create designs by need. If we get specific requests from customers we have to answer it and often create something new. What inspires you when you make a new lamp? Txuma (talking to Elodie): You, my love, inspire me, seeing your light every morning. Elodie laughs. Txuma: No but really we are both very creative people and we know how to do things with our hands. However we are not professionals, we have not studied design. Elodie: But when you are constantly working on making new designs you keep your eyes open for different ideas or shapes that could be crafted into lamps. Do you have a favorite material that you use? 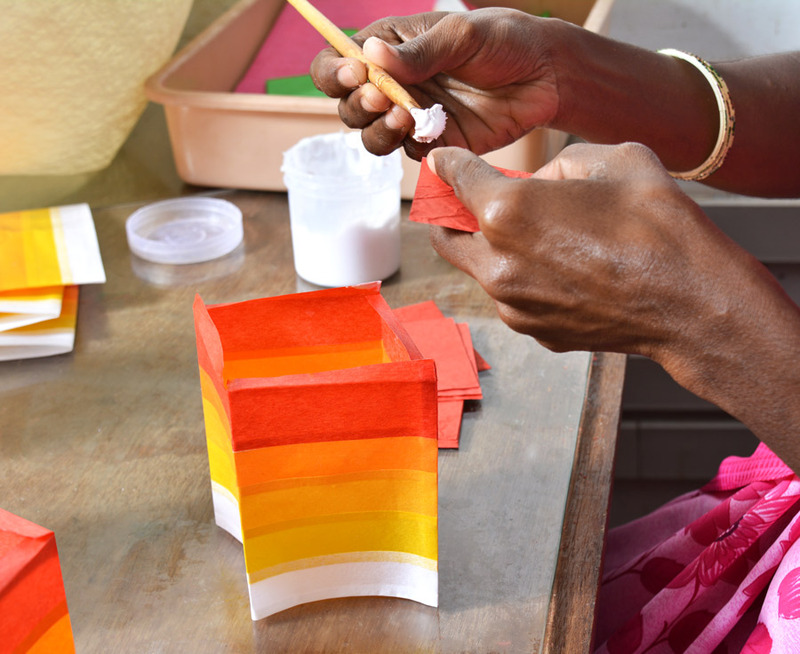 Elodie: In general we use thread and Japanese paper, these are our main materials. But we explore all the time. But yes the main material is thread, mainly because our thread globes are so popular, and Japanese Paper. Lights are a very powerful tool to create moods and atmospheres in living spaces. What does lighting mean to you? Elodie: If you go into a place which has, for example, white tube lights you might start feeling very cold and uncomfortable. So obviously it affects your mood. If you go into a house with warm lighting you will feel welcome and comfortable, so of course this is a big aspect of our work. We want to craft lamps that bring good vibes into spaces, that create a nice atmosphere. Txuma: For us color is very important. Our mood is very much connected to the exposure of different colors. So we also experiment with different color shades. 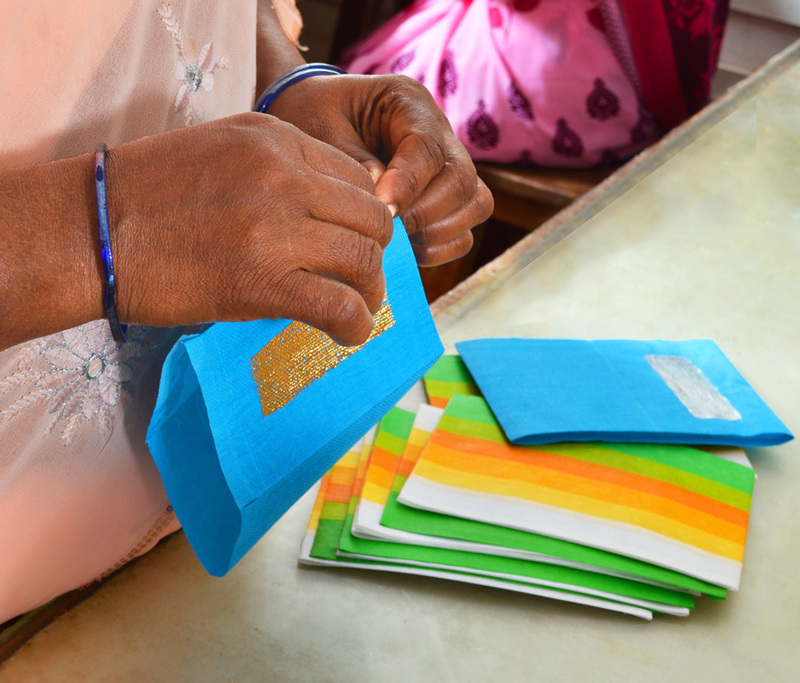 How does Auroville influence your way of running a business? Auroville influences our business 100%. 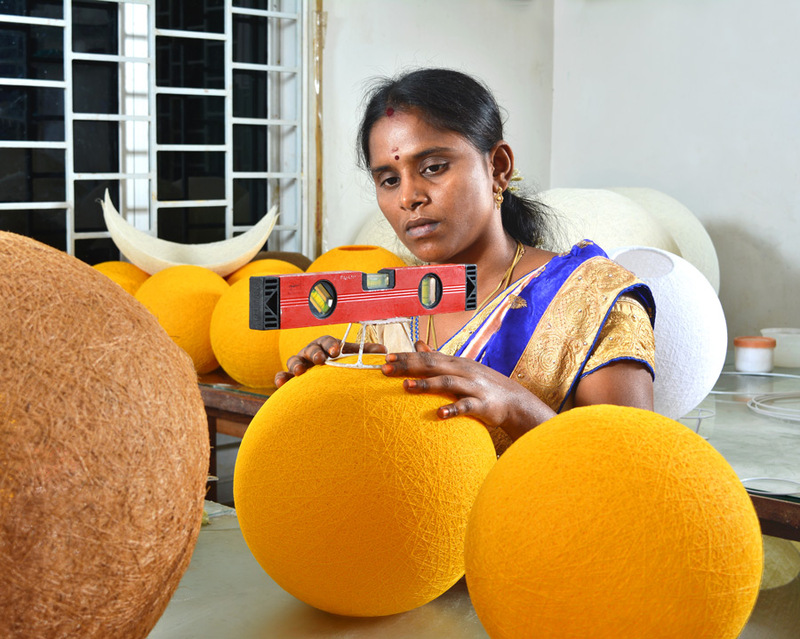 Auroville products have a huge reputation for high quality and fair production process. We work hard so that this standard is kept. Elodie: For me running Glimpse means that this is my work right now, it is actually not important if I run a business or if I go teaching or if I do gardening for the community. It just means that I am working, my need lays with the Karma Yoga, this is what we do here. Which lamps do you have in your home? Both laugh. Elodie: In our house we don’t have the best lamps because we are always so busy. There is a French saying that the shoemaker has the worst shoes. It is like that for us. We should change so many of our lamps at home but in the end we have always something to do for Glimpse and our work always goes first. 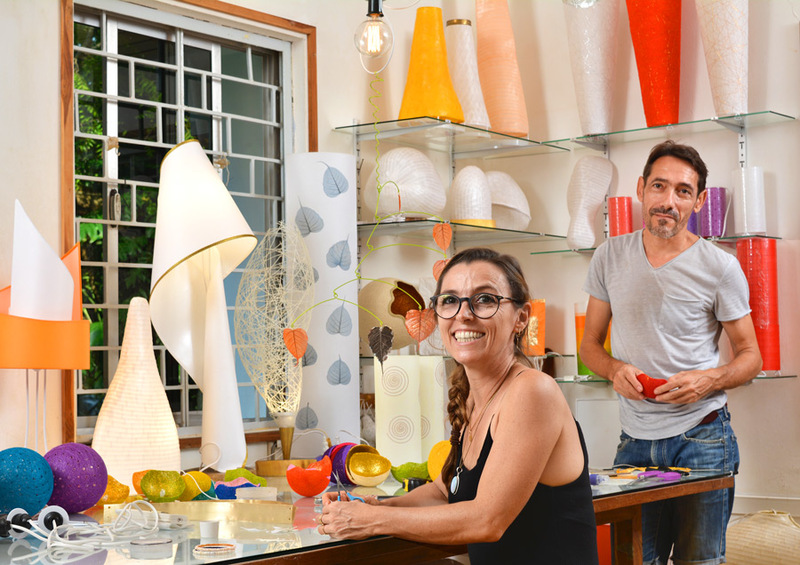 Txuma: Sometimes if we make lamps that do not sell we bring them home. What are the challenges you face running your business? Elodie: The weather actually, our production is very much tied to the weather. The labour too, because we have a high quality standard and maintaining it can be a challenge. Txuma: Yes, that is true. Every single piece goes through our hand. It doesn’t matter how big or small we check everything. There is not one lamp that leaves Glimpse without going through either Elodie's or my hands. Elodie: Of course we have phases where we have no orders so we need to organize ourselves and what we do during these dry periods. We simply have to keep going! Elodie: I came here 30 years ago and today Auroville is my life. Of course I came here for a reason, which is the whole philosophy of Auroville, and we are a 100% here for that. After some time however you just live here and make the most of it. Txuma: You need to find a way to support yourself. This is what Glimpse is for us and if we are successful we can give back. And if Auroville is successful we will be successful. So it is a beautiful exchange. What is next for Glimpse? Elodie: Oh, I don’t even know what is next for me. We will see as it comes. We are not even planning for tomorrow, so the future of Glimpse? We will see I guess. We will continue with designing and creating new lamps, that is for sure though.